So our July 4th Barbecue was a lot of fun – we had enough food to feed an army, and stuffed ourselves so full we could barely fit watermelon and pie in our bellies after all of the grilled foods were eaten. I wanted to save room for veggie kebabs (should have taken a photo of those, but I was pretty distracted at the time) so I only ate one veggie burger (full disclosure: sometimes I will stuff my face with two when I’m barbecuing them at home!). 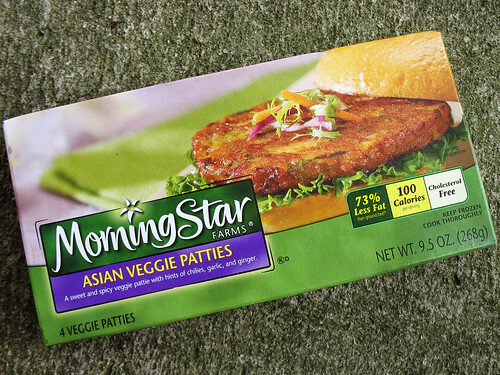 I picked the Asian Veggie Patties, since MorningStar’s frozen veggie burgers had been on sale when I was at the grocery store that morning. These ones are pretty tasty, I bet I would have eaten them on a regular basis as a teenager if they had existed then. 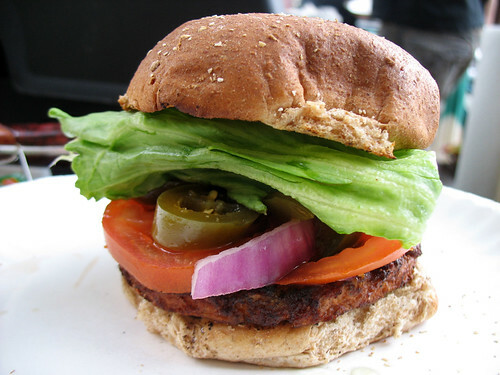 The sweet-and-sour flavor is a pleasant surprise in a veggie burger. 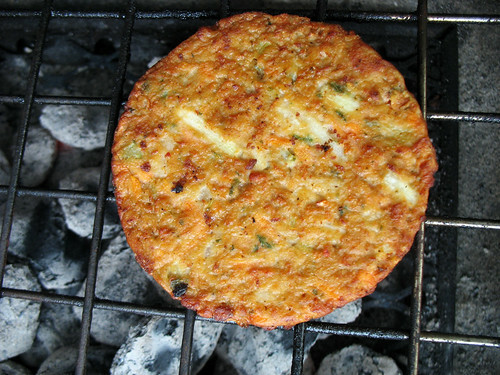 The patty consists mainly of a light-colored soy faux-meat texture, with carrots, peppers, and other bits of veggies mixed in. Oddly enough, the ingredient list says it contains not only eggs but dairy as well. Not sure why, since some of MorningStar’s other products are definitely vegan. 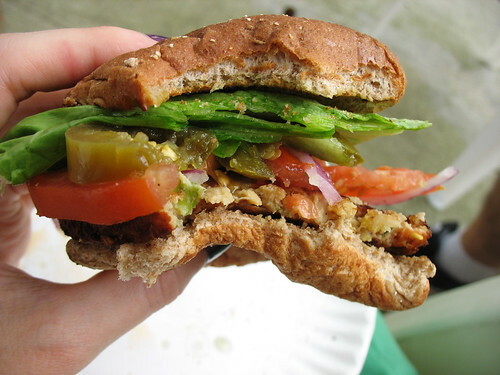 I loaded it up with lettuce, tomato, red onions, and pickled jalapenos on a whole wheat bun. I’m really into jalapenos on burgers these days. The result: a very tasty Fourth of July burger! I probably wouldn't want to have the sweet and sour flavor every time I eat a burger, but once in awhile to mix things up, these are a great option to have in the freezer. I was too busy having fun to really take photos of anything other than burgers, but this accidental kinda-panorama pretty much sums up the wonderful evening we had out on the patio. Oh, and the fireworks later were awesome too. No, not the big Macy’s ones, but the (illegal) display our own neighborhood put on which we could see over the rooftops. Really, just the perfect Fourth of July. Damn, I wish Morningstar would make their stuff vegan. I heard a rumor a few years back that they were removing eggs and dairy from their entire line. But I guess it was just a rumor because new products have come out that are definitely still not vegan. Boo!! It looks so tasty! I want! Those burgers were amazing before going vegan. But now, morningstar farms really disappoints me. Field Roast is worth trying, i love the celebration roast, boca, and amy's make many more vegan items than morningstar farms does. Maybe because they're a Kellogg company, so they rely on animals for the whole corporation (dairy). It's a shame since I know they can make these products without the diary or egg, and they'd probably be cheaper to produce and appeal to a larger audience. I do love the Asian patties, and sausage patties. Hope they make them vegan.